Google tests a new interface for Google Bookmarks that lets you share your bookmarks. You can now create bookmark lists and share them with other people. Google says that "lists make it easy to organize and share stuff you find on the web", but the new feature adds what was already available in Google Notebook, a great service that allowed you to create collections of interesting content from the web. Google stopped developing the service, but Google Notebook is still available for the existing users. "We're working hard to improve Bookmarks and make saving and sharing stuff on the web easier than ever. That's why we've created lists. Like labels, lists let you organize your stuff into categories. But they can do so much more! For example, lists have the smarts to pull the most important information (like maps and reviews) from the sites you care about, and put it in a single place. You can easily see when a site in your list has been updated. Sharing and collaboration is easy, making lists an ideal way to plan a trip, research a purchase, or organize an event," suggests Google. Here's an example of a public list that shows useful web pages related to Google Bookmarks lists and here's a list of web pages related to Seattle. You can follow a list to be notified by email when the list changes. The nice thing about Google Bookmarks lists is that you can convert labels to lists. It's easy to add new web pages to a list thanks to the integration with Google Search, Google adds relevant thumbnails and monitors web pages for new content. And if you invite other people to your list, they can add new web pages, reorder the list, add comments and more. So Docs isn't replacing bookmarks after all. Having two Google Bookmark systems that don't talk to each other is a PITA! Agreed, this is really odd. Why don't the Google products work together? I would love to have a better interface for my bookmarks then Google docs. @Hugh I though the Reading Share with a note feature was going to fill that gap... but I'm glad to see this come to Bookmarks anyway. Just wishing for a bit more integration between the various Google properties. Maybe it was easier to implement the synchronization with Google Docs because it's one way (you can't edit bookmarks in Google Docs). Another explanation could be that Google Chrome's sync engine will be used to sync your files with Google Docs. It's also important to point out that Google Bookmarks uses labels, while Chrome uses folders and subfolders. It will be nice if users were able to import Delicious feeds without having to use a script to automate the process. Auto complete on labels are missing. What gives? 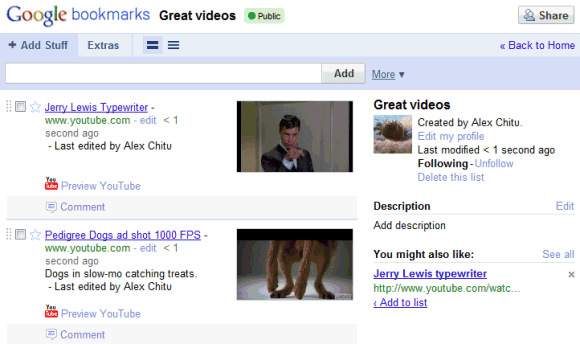 Would smart to integrate Google Apps into the whole experience just as Google users have. Great idea but the product doesn't sell well. Staying with delicious and digg. Someone needs to get fired in the product development. How about integrate Buzz and Bookmarks. Nice. Now if we could check for duplicates and dead links. Looks interesting, but I switched from Google Bookmarks to Delicious a few years ago and haven't looked back. I like that link preview thing, that looks nice, kind of like media previews in Gmail, but I really don't like that there's no Import or way to edit a URL, like in Delicious. so bookmarks in chrome/gdocs is for accessing anywhere and google bookmarks is for sharing? greatly anticipated ... really needed. and sloppy sloppy sloppy (and this is by the best and brightest - those arrogant engineers who brag about those recruitment tests). very sloppy. the "create list for *label name* " function ... seems like a dream come true except when you realize it only copies 25 links at a time. I have 214 links under one label... what a friggin pain. Google is this generation's microsoft. I guess I''ll have to wait until version 3.0 for you to get it right. 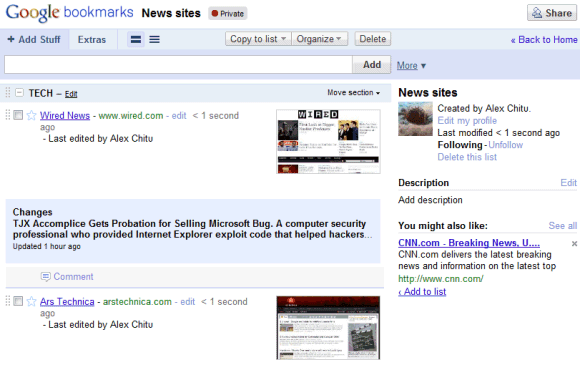 Several years ago, I imported some links into Google Bookmarks. I STILL cannot edit the URL's only the name and the description. Remove the old link and star the new one? Why not just edit the URL? This is a cool product and it also highlights my biggest frustration using Google services. They don't all integrate and work well together. I have a MotoDroid, Win7, and use Chrome. I should be able to use one bookmark service, my Picasa should be seamless, and all the products should work together easily. They don't. I find this announcement frustrating rather than exciting. 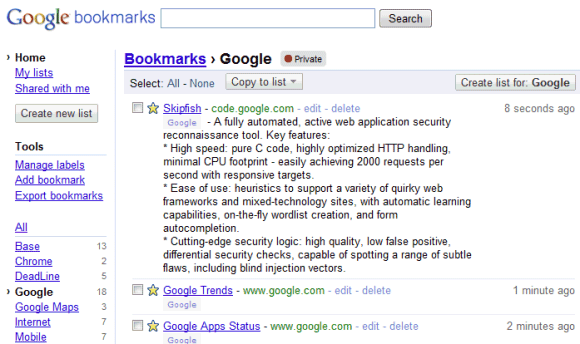 Google Lists is a feature of Google Bookmarks, not a separate service. Why do I need Google Bookmarks and Chrome Bookmarks in Google Docs? Google Bookmarks really helps. Nested category will be even better. Nice. But I noticed also the lack of auto-complete in labels and the fact links open in a new window/tab (mildly annoying for me - I'd like this to be something we can turn on/off in 'settings'). wow, this looks like a great way to share and save bookmarks. I like how google tries to put som new twist on things that we take for granted in internet tools like browsers. Nice addition to the bookmark sync options in chrome. XMarks still has them beat by a big margin. so, if i already have a bookmark maintained in google bookmark, and now if i wanna share it to others, i need to copy that bookmark to google list. that means i always need to maintain the bookmark in 2 places???? am i right? I don't find this feature of Google that much useful because the normal way of bookmarking is also working okay and this has no extra and existing alternation in it. And Google should make things compatible with different browsers which is still lacking. I can see that if Google works on Bookmarks and Lists then it MIGHT become a "better Google Notebook". As I have over 40 Notebooks and about half are shared or published what I would like and expect Google to provide for Notebook-users is a smooth transfer system, ie. 5) Also transfer the SEPARATE "Google Bookmarks" held in Notebook as these are not included in "Google Bookmarks" for some reason (Google is still advertising Notebook as a way to organise Bookmarks better even though it is no longer supporting Notebook. I think these "Notebook Bookmarks" are the ones that automatically transferred from Google Bookmarks when I opened a Notebook Account). If Google does not provide a way to save Notebook-users the slog and time of transferring to Bookmark Lists manually then I am NOT going to do it. The risk is that I will have to repeat the exercise if Google decides on another whim to ditch Bookmarks Lists. The way that Notebook has been abandoned by Google is high-handed, inconsiderate and incompetent. Particularly as Notebook was provided by Google as a way to "better organise Bookmarks" in the first place. Google's cavalier attitude to privacy issues means that I am also transferring all the Google Groups that I run to other providers (if you post to Google Groups, you need to be aware of the serious privacy issues involved, see http://groups.google.com/group/google-groups-guide/search?group=google-groups-guide&q=privacy&qt_g=Search+this+group and a bit of a workaround http://ukes4fun.org.uk/google-group-help-and-tips/google-groups-privacy-issues/ ). I really love Google Bookmark . I don't worry about my bookmarks since I've used Chrome . I cant add new labels in Bookmarks! it that just me ??? My "copy to list" function works once in chrome then the only option I get is to create a new one. Bookmarks was never ideal due to its inherited organisation properties. (architecture:Sustainable:Roofing) is possible, but if I had some sustainable wall systems, I have to put in a whole new (architecture:Sustainable:Walls) and so on. I now have over 300 categories with 1000's of bookmarks. Its close to impossible. Then came lists. I was jumping with joy until I started to organise my bookmarks again. 2. I can only organise bookmarks in 2 levels. Title>Section. There are cases where my bookmarks are 4 levels deep. Think of each level as a folder. For the architecture example I gave I am forced to remove the middle folder (sustainable) which leaves me with a similar problem. Would be a cool feature once the bookmarks lists are available on an Android phone (currently a bookmark list is shown as a link on the phone but there is no way to click on that link !!!) and once this feature can be sync'ed with Chrome. - Allow me to choose all labels that I want included in the Lists and to dynmically update the lists based on tag modification in my URLs. Otherwise this feature is useless. Google, please just make a renewed commitment to notebooks, or at least assure us that they will be maintained. I see people on so many sites trying to figure out how to transfer the contents of their notebooks to something else, but none of the new applications are as convenient. I have a great deal of material on notebooks for several online courses I teach, and it would be a real problem if I lost it. if you share a list that's removed (by owner) without deleting your sharing permission (beforehand) the list will hang in your shared set. Did google bookmarks lists break? it doesn't seem to work anymore. Now I have a label called MyBookMarkList. I liked lists... what happened? Canvai, they took all your carefully labeled lists, and threw them into a giant messed up pile that they labeled "MyBookMarkList". Thanks Google, very thoughtful. Didn't know about it. Seems to be a good way to share and save bookmarks. I have spent hours trying to get "my lists" back. I did not know that Google messed up the option until I get into this blogspot accidentally. Now, is there any suggestions how to get my lists of bookmarks back?? Plan a wedding and event in budget with us & get many creative wedding plan ideas at Anupam Caterers. I don't find any bookmarking list here thought of sharing it across my friends to work on Carpet Cleaning Perth keyword. Omway Ltd Relocation and Logistics Services provider company. We are one of the largest company in the World. We are provide all services lime Packers and Movers, Movers and Packers, Packers & Movers, Movers & Packers, Movers, Moving Company, Home Relocation Services, Household Shifting Services, cargo Moving, Car carrier services, Vehicle Moving Services, Trucking Company etc. Thanks for your information! It is very helpfull West Midlands information from here.